Delightful Deer Hollow in Tampa Bay Golf & Country Club IS the place to be! Great Curb appeal with landscaped yard and screened front entry with tile welcomes you to this Light, Bright OPEN floor plan with large rooms, new interior paint, carpet, Peron floors in Kitchen and dining room, trey ceilings, arched openings and the lowest village fee in the community with more space between homes! 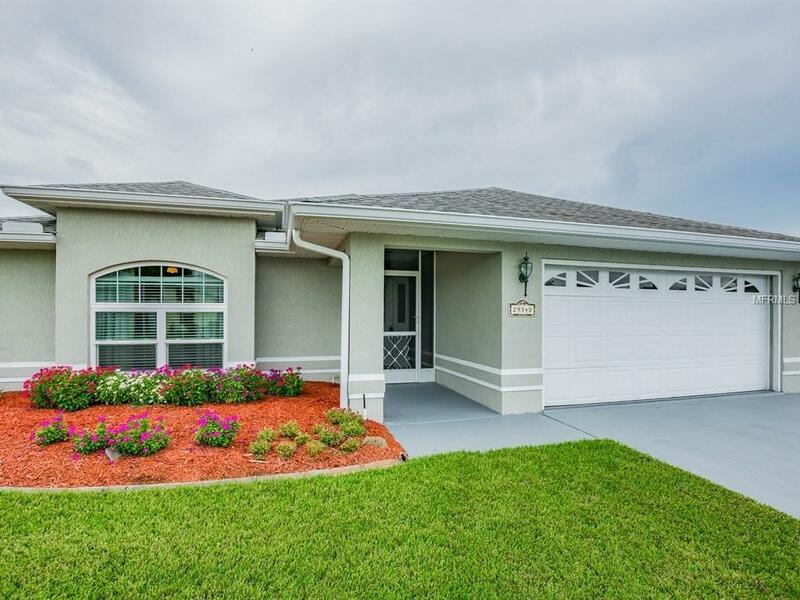 This updated concrete block and stucco home, with Florida room extension under roof creating a bonus room, is READY for you and most is NEW Roof & Water Heater replaced 2013, A/C replaced in 2016, Brand New Whirlpool Washer & Dryer 2019, PELLA windows 2016, Seamless Gutters 2016, Carpeting 2016, New power panel and surge protector, Solar Powered Attic fan with radiant barrier added 2017, Kitchen updated 2018 with Specialty GRANITE counters, new floors, new appliances, Exquisite $19K updated Master Bath & Guest bath 2018 and WIFI controlled garage door opener & thermostat. Enjoy watching Deer at dusk with private conservation behind and golf course frontage and views of the 4th green in the distance, & relax on your back lanai! Tinker in the garage with workshop, cabinets for storage, utility sink, electric panel replaced, epoxy painted floor & screen panels to enjoy the breeze. Gated, Active 55+ Community with 2 pools, spa, pro shop, Championship and Executive Golf Courses, Tennis, Library, Fitness, Billiards, On site entertainment, dog parks, restaurant and pub/grille, fun planned activities & excursions. CALL TODAY!